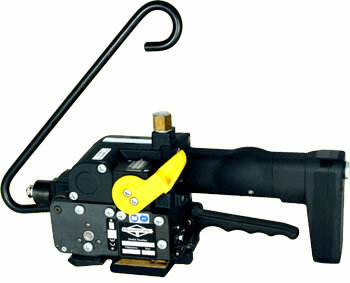 Dynaric D-355 Hand Tool - Roberts Business Machines, Inc.
No need waiting for your batteries to charge, the D355 pneumatically operated friction weld tool is ready to use the moment it is taken out of the box. The D355 offers easy strap feeding, adjustable seal time, tension settings and thickness settings and is available for use with 3/8″, 7/16”, 1/2″, or 5/8″ wide Ultraband, polypropylene, and polyester strapping. The D355 is well suited for vertical and horizontal strapping applications making this tool versatile enough to handle any load requirement.